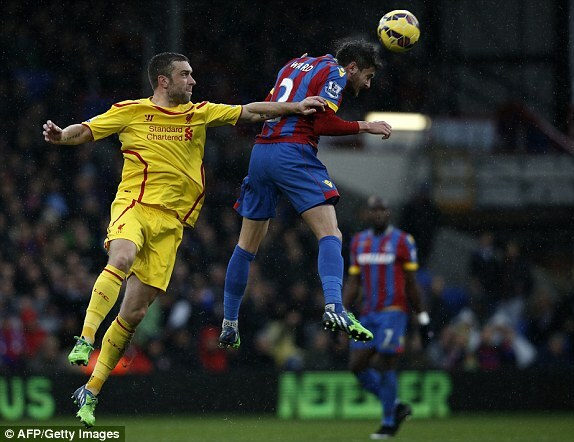 Mile Jedinak scores a sublime free kick against Liverpool earlier in the season. Once, maybe not even so long ago, if Liverpool had been drawn away to Crystal Palace, many Liverpool supporters would of thought little of the fixture, or maybe even of viewed it as good luck, a side that would cause them relatively little trouble, and certainly not a team to lose any sleep over. Now though, I think the clash might be taken a little bit more seriously by Liverpool fans. Undeniably, Liverpool are the bigger team. They boast one of the richest and most famous histories present in English football, and there will always be some magic with the club, even if their lights had dimmed somewhat in recent years, and their fiery resurgence last year under the lethal Suarez/Sturridge partnership showed that the club is not simply a relic of the past, but very much a force to be reckoned with and feared in the modern game. While Liverpool came into the season struggling for form after the departure of their star striker, and the absence of Daniel Sturridge, evidence of that same skill and desire from last season are beginning to emerge, with a nine game unbeaten run (6W, 3D) since their 3-0 defeat to bitter rivals Manchester United, Liverpool are certainly not struggling for form now. So why should they fear Crystal Palace? Why should Liverpool be concerned about a team that sit six spots, and fifteen points adrift from them in the premier league table? Why should they see them any differently to years gone by, where such a draw would of been welcomed by Liverpool fans and players alike? Well, there’s plenty of reasoning behind why Liverpool fans might not be able to shake the feeling that there might be a giant slaying looming in a competition famous for such results. The first, being Crystal Palace’s resurgence under Alan Pardew. The Eagles are putting behind them the turbulent months of Neil Warnocks reign at the club, and belief in their new manager is sky high, with the chants of “Super Alan Pardew” ringing around the ground at Selhurst Park, drowning out even the Newcastle Fans, who find the 53 year old such an unpleasant sight. With Pardew’s recent appointment to Palace, the new Eagles boss found the most famous moment of his playing career plastered across headlines as rumours of his appointment grew – a deft header that gifted Crystal Palace Victory against Liverpool in the semi finals of the FA Cup, in the 1989/1990 season. But while Crystal Palace are slowly but surely finding their feet again, and a blast from the past Liverpool would surely prefer to forget, this is not what will perhaps trouble Liverpool supporters come saturday. What will perhaps trouble them more is that there seems to be something of a curse hanging over Liverpools visits to Selhurst Park. Liverpool visited The Eagles home ground earlier this year, and took an earlier lead courtesy of Rickie Lambert, but were on the end of a comeback typical of Crystal Palace’s tenacious spirit, and ended the game with a 3-1 defeat. Before that, during Liverpools most promising season in the last decade, Crystal Palace handed them a humiliating blow that ruined their momentum, a 3-3 draw at Selhurst Park, which the never-say-die Palace squad managed to salvage in the dying embers of the game from a three goal deficit that Liverpool had built up over seventy-nine minutes of play. Crystal Palace it seems, especially at Selhurst Park, have a knack for derailing Liverpools best laid plans. Combine that with their tendency to come from behind to win this season (Second only to Tottenham), and an in form Dwight Gayle (Who scored a brace against the reds in the aforementioned 3-3 result last season), and maybe, just maybe, you’d think twice about betting against Crystal Palace this saturday. I certainly would. ← Are Snapchat and Whatsapp Something to be Afraid of?